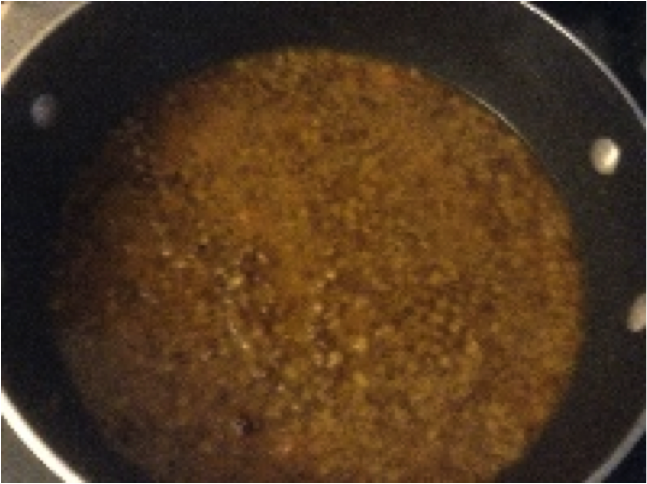 Add the paste to cooked mung beans and mix. Heat the oil until warm (with a small amount of oil, this will take only moments) and carefully add mustard seeds. The seeds will pop releasing their flavour so be sure to take care and use a lid to contain the seeds. This technique is called Vaghar in Gujarati (tarka in Hindi). Before the popping stops altogether lift the lid away just enough to ladle in some of the mung that has already been mixed with the curry paste and cover with the lid. Once the initial reaction dies down, usually within seconds, add the remaining mung mixed with the curry paste and add a little water. Add extra water if the consistency is still too thick. Heat through and simmer for 5 minutes to allow the flavours to blend together.